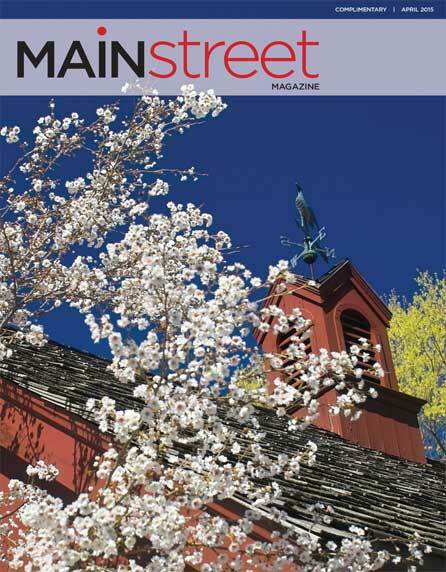 Main Street Magazine just released an interview in connection with the Stamford Museum show. The interview was by artist Brandon Kralik. Kralik: It seems to me that by working in a representational style, by "breaking the rules," it goes to follow that we are actually operating under different rules, an alternative aesthetic criteria for judging what is good and what is valuable. Would you agree with this, that Illustration is something different than what we see in Post Modern aesthetic? Gurney: I don’t think that painting representational images or telling stories with pictures necessarily breaks any rules. Who would make such rules? Telling stories and representing nature is what artists have been doing all through history. Kralik: What are your "rules" that decide if a picture is good or not? Gurney: My appreciation of art doesn’t follow any pre-set rules. I find myself moved by great works in all sorts of categories—landscapes, comic art, adventure illustration, landscape painting, portraiture. There’s good and bad art in every category, and I'm always ready to be surprised. I don’t spend much time evaluating what’s good or bad, because I’m a painter, not a critic. The best cure for bad art is good art. Kralik: Do you make a distinction between Illustration and Fine Art? Gurney: No, I don’t, because both terms are impossible to define. By fine art, do you mean gallery art? For some people the term "fine art" suggests a branch of art that's supposedly free from commercialism. Having been in the trenches in all sorts of art-making, I can attest that gallery art can often be the most commercial form. Gallery artists are always reminded of what's selling, and what's not, and are pressured by the marketplace to repeat successes more than any other kind of art. It's possible for a gallery artist to be unaffected by such things, but it's not easy. The least commercial art form I've ever experienced is magazine illustration, where the individual work of art has little influence on the ultimate commercial success of the larger work, namely the magazine. So if any art is fine in that sense, it is illustration. If “fine art” means art that is created at the artist’s own initiative, then that would include illustrated books that the artist/illustrator creates. “Illustration” is a term that means different things to different people. It can mean work that’s commissioned, work that tells a story, or work that is reproduced. Those are very different criteria, and there have been great works of art that fit one, two, or even all three of these measures. A more meaningful distinction for me is between observational work and studio work—or you might say outdoor work versus indoor work, the outer eye versus the inner eye. Both aspects of the artistic life are essential to me, and always have been. Kralik: Something that you have said, and which Mort Kunstler reiterated in his talk was that in part the goal is to create something, a painting, that cannot be photographed. 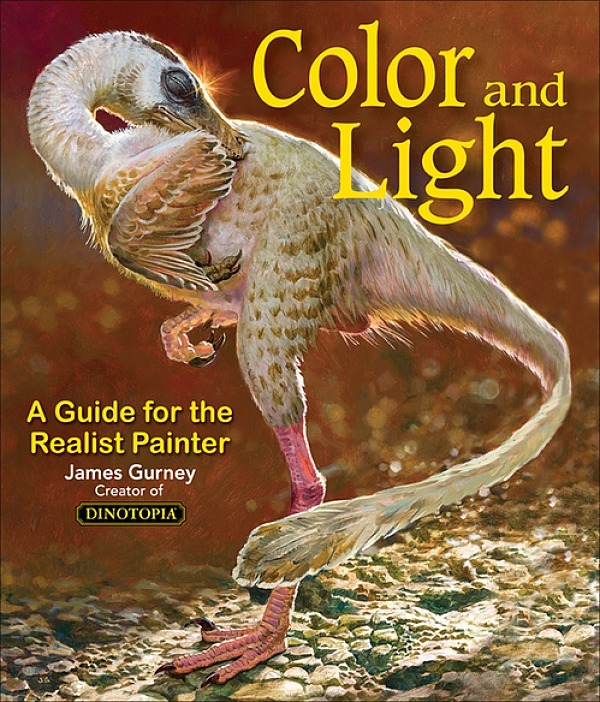 You have done this with your Dinotopia series and in your numerous illustrations for National Geographic. Is this a primary concern or thought behind your work? What is the greatest benefit that realist painting has to offer us? To show us what we cannot see any other way, or to copy nature, or both? Gurney: I agree with Mr. Kunstler—painting the things that we can only imagine is one of my favorite challenges as an artist. I did a lot of work for National Geographic, including pictures of the the legendary voyages of Jason and Ulysses, and reconstructions of the kingdom of Kush in Nubia and the civilization of the Etruscans in Italy. Each project was a stimulating chance to travel for research and to work directly with experts to recreate a world that could never be photographed. I like to call this kind of painting “imaginative realism.” Imaginative realism is different from what we usually think of as fantasy. It’s a broader term, including any scene that can’t be photographed or observed directly. Imaginative realism comes into play when reconstructing a scene from ancient Rome, a dinosaur in its habitat, a battle from the Civil War, or a portrayal of the Titanic on the sea floor. These are modern versions of what used to be called history painting. Most wildlife art falls into this category, too, because wildlife artists can’t just snap a photo and interpret it in paint; they have to develop a scene first in their imagination and use their knowledge of nature to create a believable composition. What all these kinds of pictures have in common is that the artist begins with an imaginary idea, and then works hard to make the resulting picture as realistic as possible. But I have also always painted and sketched from life at every opportunity. I’m currently working on a series of instructional documentaries on painting on location. The first one is called “Watercolor in the Wild,” and the next two will cover gouache and casein. Kralik: What is the role of representational painting in our society? Gurney: I can’t speak in general terms about what painting means for other artists or for society as a whole. I only know what motivates me to paint, and that’s the excitement that comes while making an image come to life out of the physical materials that I move around with my hands. 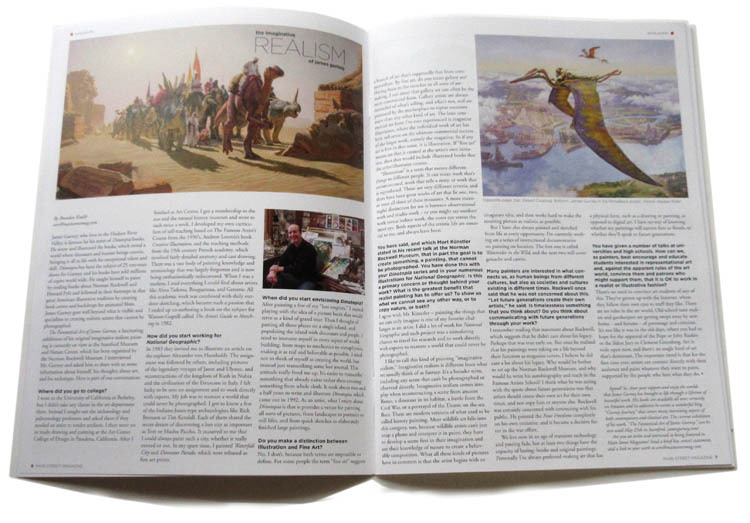 Whether it’s an imaginary scene or a portrayal of something I’m observing, each picture is a kind of conjuring process, and an illustrated book like Dinotopia combines my love of writing, lettering, book design, storytelling, and painting into a larger act of creation. Kralik: For myself, I am interested in what connects us, as human beings from different cultures but also as societies and cultures existing in different times. Rockwell once said that he was not concerned about this. "Let future generations create their own artists," he said. Is timelessness something that you think about? Do you think about communicating with future generations through your work? Gurney: I remember reading that statement about Rockwell, which suggests that he didn’t care about his legacy. Perhaps that was true early on. But once he realized that his paintings were taking on a life beyond their function as magazine covers, I believe he did care a lot about his legacy. Why would he bother to set up the Norman Rockwell Museum, and why would he write his autobiography and teach in the Famous Artists School ? I think what he was saying with the quote about future generations was that artists should create their own art for their own times, and not copy him or anyone else. Rockwell was certainly concerned with connecting with his public. He painted the Four Freedoms completely on his own initiative, and it became a decisive factor in the war effort. We live now in an age of transient technology and passing fads, but at least two things have the capacity of lasting: books and original paintings. Personally I’ve always preferred making art that has a physical embodiment, such as a drawing or painting, as opposed to digital art. I have no way of knowing whether my paintings will survive fires or floods, or whether they’ll speak to future generations. Kralik: The idea that an artist must express themselves is paramount in Post Modern ideology and with representational painters it seems that it is partly this but also that it is important to "connect" with viewers using more universal symbols than purely subjective imagery. How much of your work is for yourself and how much is for your viewer? As if that were a measurable thing. Gurney: Expression plays a role in my art certainly, because I have strong feelings that I bring to my paintings, and I like my art to communicate them. But expression isn’t as important for me as observation. I love to capture the world around me, and I do that for my own pleasure, though more and more I’m sharing my sketchbooks through video and other new media. I have literally dozens of pencil sketchbooks filled with studies of people that I’ve met and places that I’ve traveled. 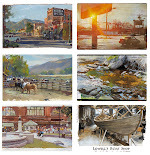 My studio is crowded with boxes full of small oil studies from faraway places and local vistas from the Hudson Valley. Sometimes the goal in an outdoor study is to capture a particular atmospheric effect or a color relationship, or to document the rapids in a stream or the unique quality of a sunset. Kralik: How do you view the changes within the representational art world in the past 25 years or so? Realist painting seems to definitely be making a comeback it could be said. Do you agree? Why is that? Gurney: Realist painting is certainly making a comeback, but I’ve also noticed a huge rise in interest in animation, graphic novels, and concept art when I visit art schools. Along with the return of realism as a mode of painting, popular forms of art are finding their way into academia and museums. The Museum of Modern Art had huge successes with the exhibitions of Pixar and Tim Burton, and we’ve been fortunate to have had over 25 one-man museum shows on the art of Dinotopia. More and more people are realizing that illustration, comics, and animation are the mainstream story of twentieth-century American art. You couldn’t talk about 20th century music without telling the story of jazz and rock 'n' roll. The same is true in the visual arts. That’s why we’re seeing more and more popular-culture college courses, not only on Bob Dylan and the Beatles, but also about children's literature, animation history, and the history of comics. All of these popular forms have dealt with the big topics—love and death—often with wit and humor. Kralik: You have given a number of talks at universities and high schools. How can we, as painters, best encourage and educate students interested in representational art and, against the apparent rules of the art world, convince them and patrons who might support them, that it is ok to work in a realist or illustrative fashion? Gurney: There’s no need to convince art students of any of this. They’ve grown up with the Internet, where they follow their own eyes to stuff they like. There are no rules in the art world. Old-school tastemakers and gatekeepers are getting swept away by new forms—and forums—of patronage and criticism. It’s not like it was in the old days, where you had to hope for the approval of the Pope or John Ruskin or the Salon Jury or Clement Greenberg. Art is wide open now, and there’s no single kind of art that’s dominant. The important trend is that for the first time ever, artists can connect directly with their audience and paint whatever they want to paint, supported by the people who love what they do. Brandon Kralik has an exhibit of his work at the Hotchkiss School in Connecticut, and will be giving a talk there on April 27. I love that so many kinds of art are out there now. I've dealt with too many incredibly specific galleries wanting mass produced "fine art." Some of my most imaginative works have been murals for specific locations. I like the good art vs. bad art terms best! You put it perfectly! Thank you James, for furthering the "cause" of realism. The interviewer shows that the university/gallery/museum world are still trying to make "words and labels" out of what should simply be visual enjoyment. I feel this is the first time I've come to know you; these words tell me more about who you are than anything I've read to date. And who you are is the embodiment of experience, a mind open to the breadth of Art, with traction on the road, joyful expectation of what lies around every corner, an imaginative, generous Artist. Where you find time to create toons, speak, travel, paint, sketch, build pochades, blog, and take the car in for an oil change, is likely the larger miracle. Thank you James. growing up in the 50's I left "Art" because of teachers that were only willing to teach Modern Art - and who had complete contempt for Norman Rockwell. They insisted on a viewpoint that I have never been able to see or understand. And that hurt. Thank you so much for helping to bring a change from that rather brutal worldview that was the total opposite of the "Artistic Freedom" they claimed. As one who paints outdoors and in the studio; and as an instructor, the comment about inner eye and outer eye really resonated. Thanks, James. I also wanted to commend you for the way you answered questions with questionable premises, as in "Kralik: It seems to me that by working in a representational style, by "breaking the rules,..." and "How can we, as painters, best encourage and educate students interested in representational art and, AGAINST THE APPARENT RULES OF THE ARTWORLD, convince them and patrons who might support them, that it is ok to work in a realist or illustrative fashion?" Kralik also uses the phrases "Post Modern ideology", calls himself a "Post Contemporary painter" on his website, and of course I wonder how these categories differ from "Modern" art in moments when I have nothing else to do, especially as 'current art', nebulous and all-inclusive as it is, continues to move in lock step with 'modern' art, which I must assume remains a function of NOW. I thought you handled bogus, confusing, or questionable premises, even leading questions, in a very skillful manner. I realize Kralik is not a professional interviewer, but I understand he writes as a critic for the Huffington Post, among other publications. He also lives and works half the time in NYC, the Mecca of Gatekeepers. This showed in the manner in which he phrased his questions to you; nevertheless, your answers TO these questions opened my eyes for the first time to current trends in art, and how you view the landscape of art (sic) virtually without categories. Sesco, thanks for your kind words. I just answered the questions as honestly as I could. Art can be a confusing topic, mainly because all the key words you need to talk about it have been thoroughly "de-defined." I enjoyed the interview, but it was a little like an odd ping pong game. Robert, For me, those two eyes need each other. One can't see without the other. Shane, yeah, Rockwell was the bad guy to most of the teachers when I was in art school, as was Bouguereau. I figured the most interesting artists were the ones most castigated. Carol, you're so right. The words often get in the way. If we could just look at art with the word engine shut off it would be a different experience. Jennifer, I suppose the best galleries encourage their artists to try anything out, even if it doesn't seem salable. Helena, thanks. I was only speaking for myself, and not meaning to knock digital techniques, which can create amazing stuff that no other method can. James, you made so many good points in this interview that I won't try to list them. To me, the interviewer's questions revealed an "us versus them" agenda. Your answers affirmed the wide, wide scope of artmaking. Like the other commenters here, I thoroughly enjoyed this interview and the skillful way you handled the questions. Frankly, it was good for us readers that Kralik kind of pushed your buttons (if that's not too strong a phrase) because you met the challenges head-on and extremely well. A standout for me, among many, was your comparison of the supposed "freedom" of gallery art versus the "commercialism" of magazine illustration. Well done for putting the art world where it should be by some straight talking! By the way did you know that the interviewer's name. 'Kralik' is the czech for rabbit. Need I say more . . . . ..? "There are no rules in the art world. Old-school tastemakers and gatekeepers are getting swept away by new forms—and forums—of patronage and criticism. It’s not like it was in the old days, where you had to hope for the approval of the Pope or John Ruskin or the Salon Jury or Clement Greenberg. Art is wide open now, and there’s no single kind of art that’s dominant. The important trend is that for the first time ever, artists can connect directly with their audience and paint whatever they want to paint, supported by the people who love what they do." Excellent comment, one I think is right on the money. We no longer have to suffer the tyranny of an establishment, whether the French academy or the Modernist critics. The market chooses, and today the market is varied. No one dogma rules. As I am now, I would have loathed living in other eras of image-making. These days,I'd rather look at a Jean Giraud, H.R. Giger, or page from Akira than the majority of illustration/design/"fine art" that has come before (a bit of an exaggeration -the old Italians and Flemish still rule for me- but I'm trying to make a point). Considering the tools, genres, and information we have to work with now, I don't see how anyone interested in image-making wouldn't prefer now to 70 or 200 years ago. Of course there is always the good with the bad, but I'd rather live in a world where people can choose to support everything from diamond studded skulls to cyberpunk anime. (I only know what motivates me to paint, and that’s the excitement that comes while making an image come to life out of the physical materials that I move around with my hands.